INHUS (formerly Markučiai) is the largest manufacturer of prefabricated reinforced concrete products in Lithuania. They provide also related consulting, design, production, logistics and installation services. Celebrating their 60th birthday in 2015, they have customers across Scandinavia and Eastern Europe. The company has expertise in value engineering, and they are able to advise customers on choosing the most rational building structure solution and provide all the required information and services, starting from building’s concept ending with its final implementation. INHUS and the design and detailing company Concretus Designers, the largest structural engineering company in Lithuania, are parts of Concretus grupé, a consortium of nine companies conducting manufacturing, construction and landscaping business in the Baltic region. Committed to lean methodology, INHUS implement all their projects using Tekla software and BIM. 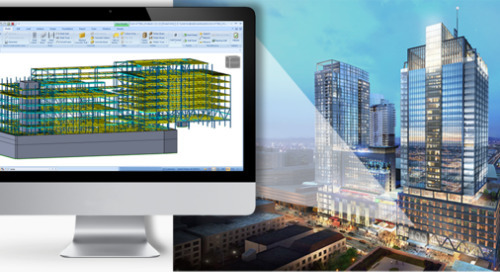 Since getting started with Tekla, the company has effectively developed their BIM use, and continually search ways to improve productivity and safety and decrease waste. In addition to design and detailing, INHUS use Tekla and the data in the accurate building information models not only for design and detailing, but also for production, logistics and construction phase. "By model-based working, we are able to solve most of the project issues already in the model and are able to deliver better-quality buildings, on budget and on time." When a request for tender comes in, the salespeople and estimators create a conceptual model using Tekla in order to get reliable information for cost estimates to use in their bid for the project. The conceptual model is usually created at a rough level, using structures modeling and elementary functionalities in Tekla. With these models, the team can get accurate quantities for estimation fast, create project visualizations and propose alternative structural solutions and identify elements with special requirements. Using element quantities from the model, the team can quickly calculate costs and schedules. INHUS has noticed that using BIM in conceptual design has improved the accuracy of their bids, which in turn has resulted in getting more contracts. Once the contract has been won the project moves on to creating an actual detailed production model. The conceptual model is normally used as a reference together with other design information and reference models, such as the architect’s model. Tekla comes with comprehensive set of intuitive tools and components, but to serve their process-specific needs in detailing, fabrication and on site, Concretus Designers have created a company-specific environment with modeling rules, customized modeling components, and settings for automatic drawing creation. Templates for drawings and modeling guidelines for different element types provide extra assistance to the modelers, who create documents and information that meets the needs of production and site operations. With over 40 skilled Tekla modelers and standardized working guidelines Concretus Designers have ensured consistency in detailing work. By managing their modeling environment centrally, they ensure that everybody uses the latest settings, drawing and reporting templates and company tools. As a result, the models have consistent information regardless of the detailer. Standardized ways of working save time in detailing, and ensure that users at plant and on site can effectively utilize accurate information in the constructible models. "Standardized ways of working save time in detailing and ensure that plant and jobsite can efficiently utilize consistent information." 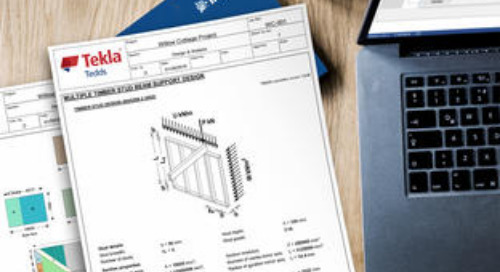 Concretus Designers use Tekla to create fabrication and erection drawings, bar bending schedules, Bills of Materials and other reports directly from the model. This reduces the amount of manual work needed in document production, simultaneously saving time and preventing human error. A structural Tekla model is a single source for information required for different documents, which ensures the data is always identical. All project changes can be revised automatically in the relevant drawings and reports. Everything is always up-to-date and there are no conflicts between the model and different documents. Accurate Tekla models allow finding the source of any project delays, and take care of challenges before they become problems. “We solve 95% of issues before the element is delivered to the site" says Audrius Tulaba, General Director of INHUS. At INHUS’s production plants, BIM streamlines the processes. The accurate model is utilized for material purchase, production planning, getting data for mesh and rebar bending machines and planning logistics. Thanks to the standardized way of working and user defined object properties that are added into model objects, the consistent, model-based data supports the company’s reporting requirements. The information can be efficiently utilized in production and throughout the entire project. INHUS and Concretus Designers use Tekla software to visualize project status. Because everybody involved at every stage of a project can add status information to Tekla model objects, and do it continuously, they all have a clear view of the progress of the project. Coordination between project parties is effective when everybody knows what is going on at any given time. This makes it much easier to deliver according to contract, even when participating offices and INHUS clients are separated by long distances. “An accurate building information model created with Tekla Structures is utilized through our processes from estimation and sales to detailing and production, logistics and erection of precast structure" says Audrius Tulaba, General Director of INHUS. "By model-based working, we are able to solve most of the project issues already in the model. There is less improvisation in the factory and construction site and we are able to deliver better-quality buildings, on budget and on time." INHUS produced, delivered and erected the Arkens Väg apartment complex, four U-shaped buildings of 5-7 stories put together from complex sandwich elements, in Haninge, Sweden. BIM made collaboration between the two contributing design and detailing companies, Concretus Designers and Ribinis buvis, easy and effective. Elements were produced in Lithuania, delivered over the sea and erected in Sweden. Object status data in model was always available to monitor and coordinate progress and scheduling and the color coding system helped everybody know what was going on as it happened. The WÄSTBYGG AB Arkens Väg project is one example of INHUS’s consistent delivery of quality projects. Their way of working that uses LEAN methodology and BIM minimizes error, reduces costs, simplifies collaboration, and helps them deliver projects on time. When projects are systematically carried out well, all parties involved maintain and grow their good reputation. "We solve 95% of issues before the element is delivered to the site."